While the West of Turkey makes every effort to keep up to date with international trends and practices, the same cannot be said of the south east. 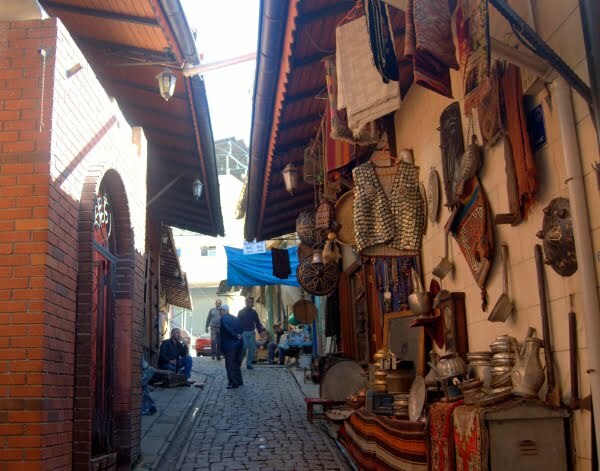 Now this is not necessary a bad thing because in the big and bustling city of Gaziantep, selected areas dedicate themselves to traditional trades. The local bazaar is one of them and it was the first time I saw a coppersmith at work. 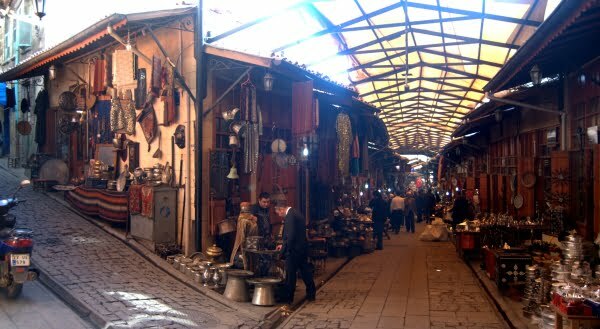 Called the Gaziantep Bakircilar çarsisi in Turkish, the cobbled paths were lined on both sides with coppersmith shops. Compared to the Grand Bazaar of Istanbul, it was very small but the skylights in the ceiling allowed natural sunlight to shine through. 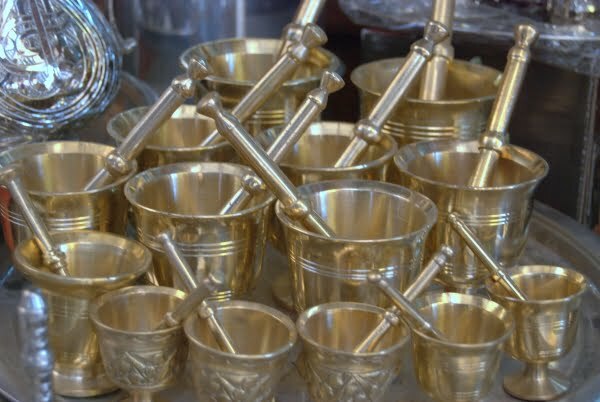 Coppersmiths were cleaning, engraving or selling their stock. They took no notice of me, sensing instantly that I was a tourist with a camera, and not copper possessions that needed cleaning. Attention was instead paid to the main bulk of their customers who seemed to be housewives and probably repeat business for them. Hassle was nonexistent, even if I stopped to browse and this rather surprised me. I cannot ever remember being in a Turkish bazaar when shop keepers did not shout slogans to attract customers. The bazaar is part of an improvement project by the local council. 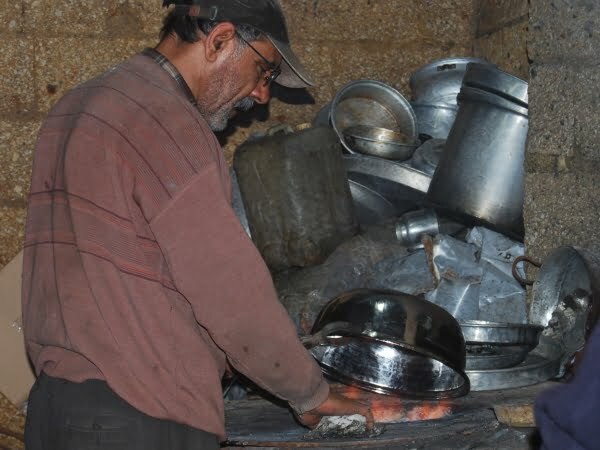 The trade of coppersmiths in Gaziantep stretches back 500 years and is passed from father to son. Perhaps sensing that modern technology has destroyed this trade in other areas, they are making an effort to keep it alive. 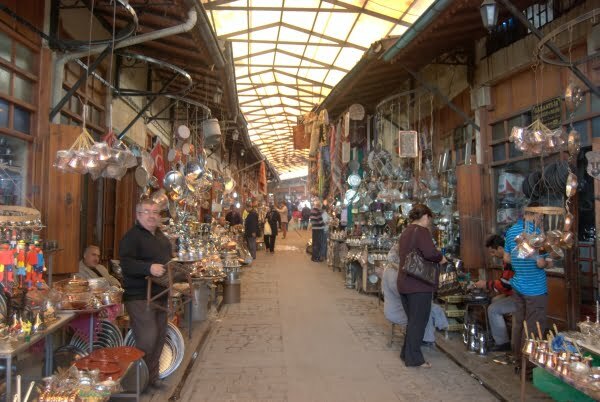 The bazaar is part of the official Culture Route of Gaziantep, and all 280 shops participate in it. I am certain that the coppersmith trade of Gaziantep will not exist in 100 years’ time but there is a small part of me that secretly hopes I am proven wrong. East bazaars are interesting always, in every country. I 2nd that! I’ve loved every single bazaar I’ve visited. Oh, how much I miss the Middle East! I love watching coppersmiths work! 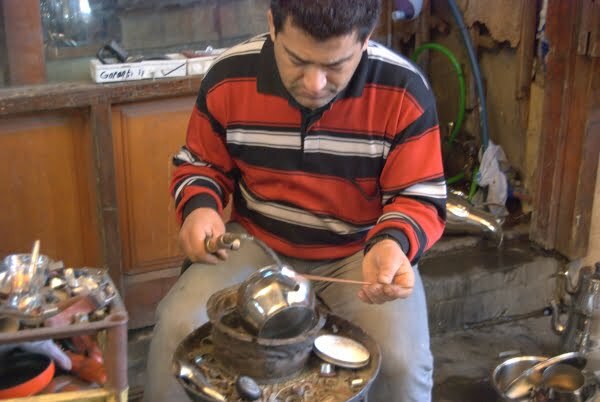 We saw them in Bosnia making Turkish coffee sets, tea pots, and all sorts of other beautiful things. Very true Derek – maybe bazaars should be an official recognized addiction! I love Gaziantep! I have some of these same faces in my photos! I hope you got a chance to eat some baklava a Imam Cagdas!